MystereBooks is pleased to feature State of Rebellion by Gordon Ryan as today's third free mystery ebook. This is the first in this series of three thrillers to date featuring the Marine Corps Colonel, later General. The fourth is scheduled to be published this Spring. 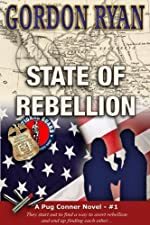 About State of Rebellion (from the publisher): California is on the brink of secession, and those who oppose this drastic political maneuver are turning up dead. Federal Agent Nicole Bentley is sent to discover what she can about the movement and meets up with Assemblyman and National Guard JAG officer Daniel Rawlings, a man whose commitment to his country runs deep in his blood. Resisting their mutual attraction, they uncover a plot devised by greedy men bent on taking power at any cost. As Colonel Pug Connor, working under the direction of the President of the United States, seeks to root out the leaders of the Western Patriot Movement — a military cadre with a chip on its shoulder — Nicole and Dan find themselves literally in the crossfire. Can they end the dispute between the various factions before they all end up martyrs for the cause?